A woman gets her thyroid checked. 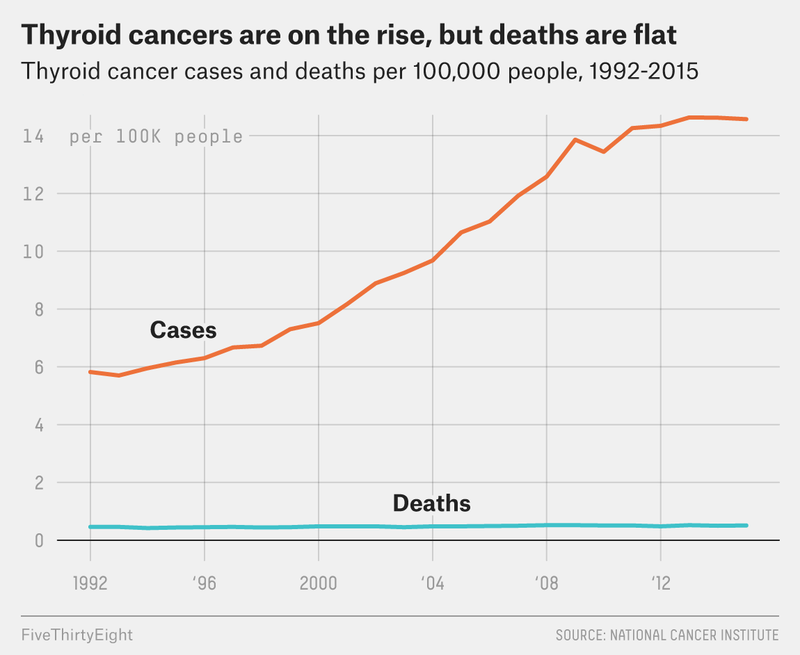 The bad news first: Thyroid cancer incidence in the U.S. has tripled since the mid-1990s, and although the number of deaths remains very low, thousands of people are having their thyroid glands removed. Now here’s the good news: We can bring those cancer rates down and save most of those thyroids with one weird trick — stop looking for these cancers. Forgoing cancer screening might seem like a reckless choice, but the current U.S. Preventive Services Task Force recommends against screening for thyroid cancer in people with no symptoms, and neither the American Thyroid Association nor the American Cancer Society advise routine thyroid cancer screening. “There’s no evidence that screening for thyroid cancer saves lives,” said Otis Brawley, chief medical and scientific officer at the American Cancer Society. The current slapdash, somewhat unintentional method of screening may also explain why about 75 percent of thyroid cancers are diagnosed in women. Women tend to get more health care than men do, Welch said, often because they’re seeking reproductive health care. And these routine office visits may increasingly come with a palpitation of your neck, he said. If you find a lump in your neck (or anywhere else in your body), yes, go to your doctor. But if your doctor says she’s going to examine your neck, he said, you might want to say no. Small papillary thyroid tumors that haven’t begun to spread can be treated in two ways: thyroid lobectomy — a procedure that removes about half of the thyroid gland — or total thyroid removal. The evidence shows that neither surgical procedure is more effective than the other, and current American Thyroid Association guidelines call for only the less drastic surgery for tumors up to 4 cm that don’t show signs of spreading. Yet right now, about 80 percent of patients who have surgery for these small, confined tumors have their entire thyroid removed. Better to be safe than sorry, right? Well, no. A total removal requires taking thyroid hormone replacement for the rest of your life and, compared to the less radical surgery, comes with a greater risk of injuring nerves that can affect your voice. An alternative approach that’s now gaining traction is active surveillance, said Louise Davies, a professor of head and neck surgery at the Dartmouth Institute for Health Policy and Clinical practice and a member of the American Thyroid Association’s surgical affairs committee. This strategy of keeping an eye on the tumor, but not taking action unless it grows or changes, is now used in prostate cancer and is being tested for certain early-stage breast cancers. Researchers have proposed studying this approach in thyroid cancer too, Davies said. CLARIFICATION (Aug. 6, 2018, 5:05 p.m.): A previous version of this story described papillary thyroid cancer as “benign.” While this is accurate according to the popular understanding of the word, the sentence has been updated to be more clear about what makes this type of cancer less harmful and to avoid confusion with the medical sense of the word.